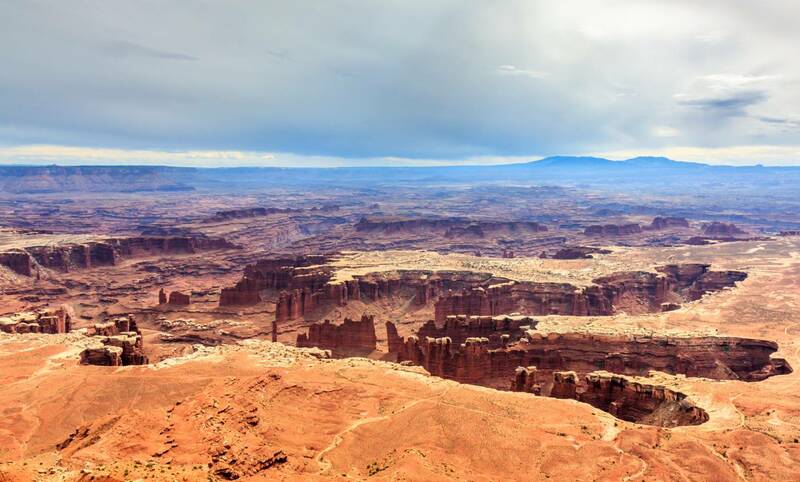 Canyonlands is like three national parks. I had had my adventure in the remote Needles District, but I also wanted to visit the more popular Island in the Sky. I would’t be making it to the inaccessible Maze District on this trip, unfortunately. 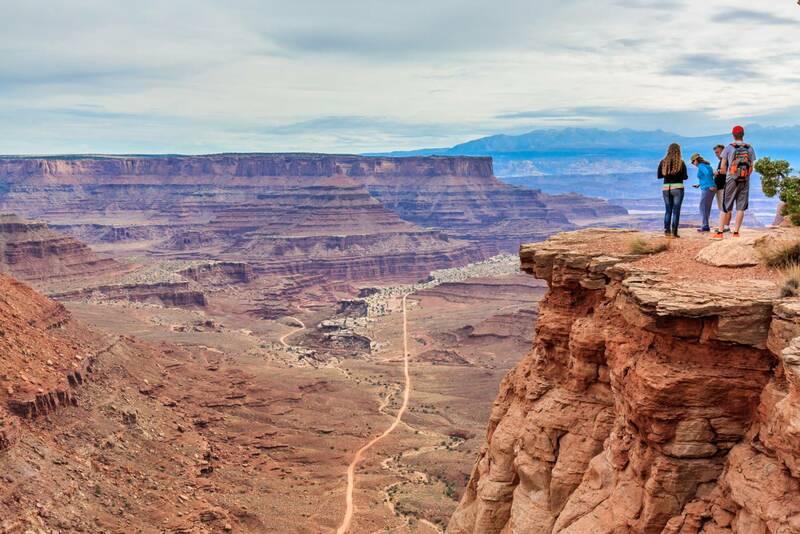 The Island in the Sky takes its name from the fact that it looks down on the canyon far below. The scale of the place is incredible, and the views go on forever. As if the huge canyon isn’t enough, there’s a huge gorge, a canyon within a canyon, below. 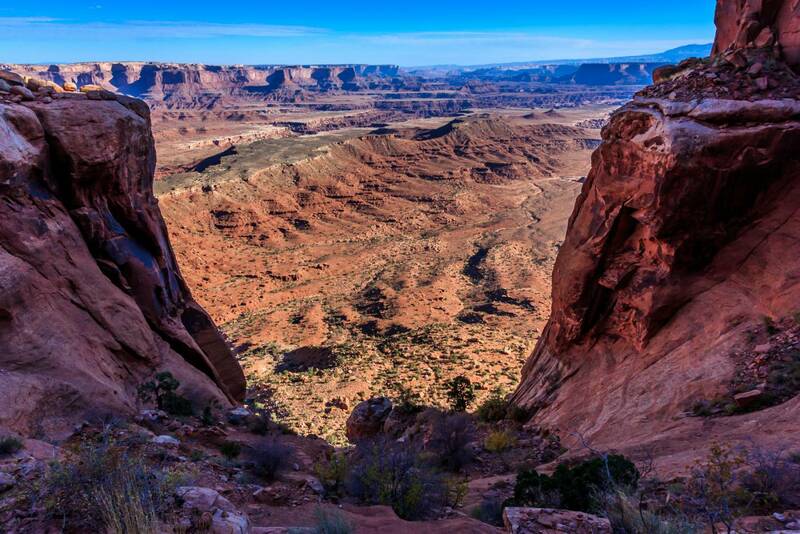 Surrounding this gorge is a white rim of limestone, and surrounding that is the White Rim Road. I was jealous of the people having multi-day 4WD adventures circumnavigating this road. I didn’t have any big plans in this part of the park, but I did want to spend a day hiking below the rim. The selection of long trails was limited, but it looked like the Gooseberry trail would keep me busy for most of the day. I didn’t know what I was getting myself into with this trail! It descends 1,500 ft over two miles, which is a pretty big change in elevation. But it’s not evenly distributed. Over the first 0.8 miles, it drops 1,200 ft. That’s the height of the Empire State Building. I imaging walking down 1,200 ft of stairs would get tiring, but this trail was not stairs. It is an unmaintained trail, with steep switchbacks. I had to scramble in places, and some parts were exposed, and a bit scary. But the views were quite incredible. On the Island in the Sky. 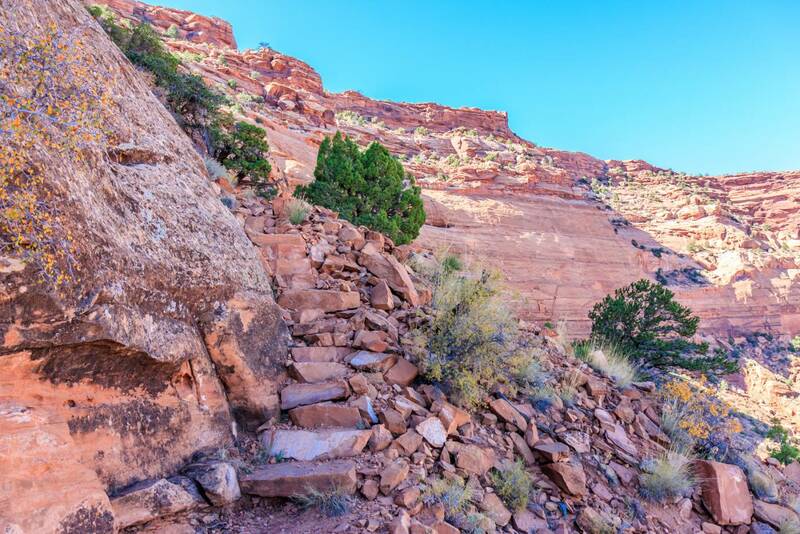 Descending below canyon rims is always interesting, because the trails take you through the different rock layers. The most recent, or uppermost layers, were the steepest. Once I reached the middle part the descent became more gradual. Beyond this the trail was a dry wash, which was gravely, but relatively flat and easy. Looking down from the plateau of the Island in the Sky, the White Rim Road was so far away. It seemed impossible to walk down there. But the dry wash eventually ended, and there it was. A few Jeeps passed, and the drivers regarded me with surprise. How did I get down here, they must have thought? A hardy biker passed. The terrain is almost too big to fathom. 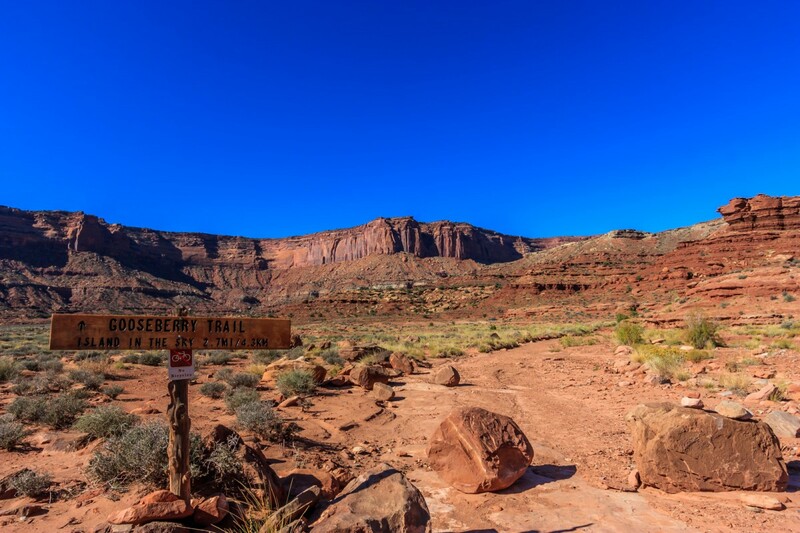 Once the traffic jam of two Jeeps and a bike subsided, I crossed the road and walked to the white rim. I stood on it and looked down into the gorge. It didn’t look like there was a way to get down there. Plus, I know the climb out would be much harder than the walk down. And hard it was, once I got to the steep part. It seemed a bit scarier too. But I made it up just fine. I was pretty glad when I was back on top of the flat plateau. The Gooseberry trail is a good challenge for a day. It’s also hiked infrequently, so it’s a good way to get away from the crowds. 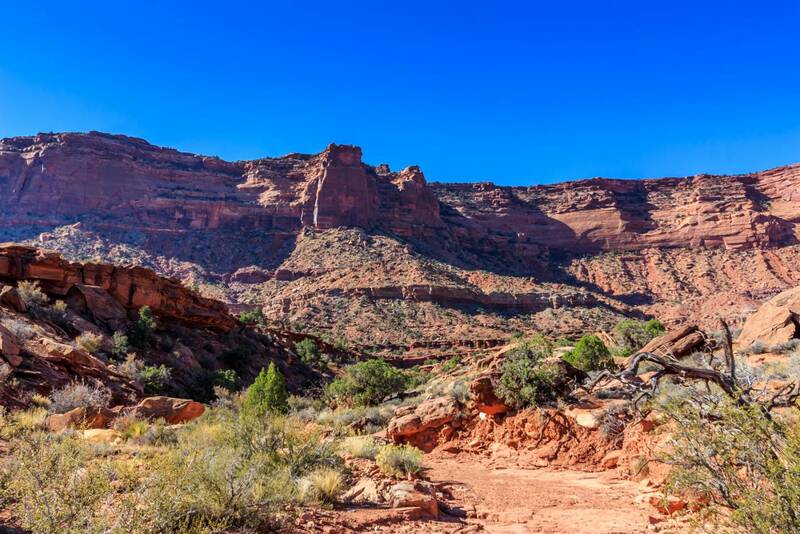 It’s also one of the few ways to get to the White Rim Road without a Jeep. Going down was a steep descent. It’s hard to believe there’s a trail there somewhere. Getting back up involved some pretty intense stair climbing. Cool, Terry. On my trip to Island in the Sky I hiked many trails but none descending from the plateau. When you climbed the rock stairs did you think about the trail construction crew. It was probably the CCC and what a lot of very hard work. I’ve hiked many trails they built. Some have rock walls with no mortar and are still in great condition after all these years. Hi Richard, yes, I often though about the great debt we owe the CCC. They built so many trails and facilities in our parks, including the Gooseberry trail.